Retailers/reﬁllers of crop protection products need to follow new rules checklist. Attention is necessary to mini-bulk containers if ag retailers expect to continue using them to supply pesticides. New U.S. Environmental Protection Agency rules and regulations for refillable containers are going into effect in 2011, and extensive action has to take place before that date to confirm portable refillable containers meet standards. The term mini-bulk is being replaced in conversations and in documents with “portable refillable containers.” The refillable container part of the new EPA Pesticide Container and Containment (PCC) rule will be enforced nationally with full enforcement beginning Aug. 16, 2011. Some states such as New York are completing even more stringent rulemaking of their own. There are three major requirements that stand out when analyzing the new rules—need for use of tamper-evident seals or one-way valves, permanent container identification numbers and the containers meeting at least DOT PG III packaging requirements. 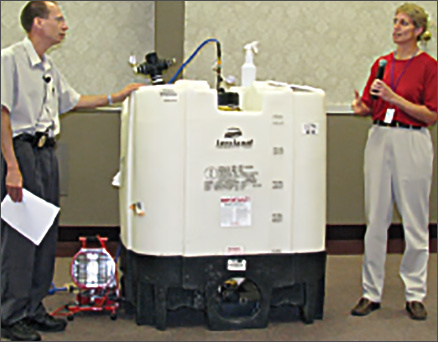 At the National Agronomic, Environmental, Health and Safety School (NAEHSS) last August, a special education session about these containers ended the two-day school. Nancy Fitz, Office of Pesticide Programs, U.S. Environmental Protection Agency, and Marty Fitzpatrick, product stewardship, BASF Agricultural Products Group, were the presenters. Several tanks/containers/mini-bulks were on display for discussion and as examples. Fitz is doing additional informational sessions leading up to the new rule and regulations enforcement. Fitz and Fitzpatrick used a 16-point checklist for portable refillable containers that was developed under sponsorship of the American Agronomic Stewardship Alliance, CropLife America and the National Association of State Departments of Agriculture. The checklist can be linked to from several Web sites that go back to the Illinois Fertilizer and Chemical Association site. You can also use the simplified link of http://tinyurl.com/ybemgcv. There also is a training video that Fitz and Fitzpatrick produced at the Safety School, and it is available to view by going to http://pesticidestewardship.org/container/Pages/Video.aspx . Most of the rule changes pertain to what must occur before an ag retailer can refill a mini-bulk or portable refillable container and the “paperwork” that must be supplied by the pesticide registrant to prove the appropriate container is being used to transport the crop protection products. The primary requirement to prevent cross contamination is the requirement for portable refillable containers holding liquids to have one-way valves, tamper-evident devices or both on all openings, except vents. A tamper-evident device most likely would be a wire seal looped cap that would require cutting the wire to open it or a racheted cap such as the seal on a gallon of milk that breaks apart when twisted. “It is not that the device is to be tamper proof but tamper evident,” Fitz explained. The use of these valves and devices allows “a refiller to be assured that only the original pesticide was in the container and that someone didn’t get into it and use it for something else,” she said. Each portable refillable container must have a “unique serial number or other identifying mark.” Recordkeeping specific to each container should be a permanent data file or some type of checklist. Fitz explained that retailers do not have to use the original pesticide manufacturer’s serial number but can assign their own coding, numbering system. She noted how the numbering is required in repackaging to record the date that the container is refilled with what product. Keeping track of the container in all ways is also logical using a checklist, she noted. Every tank has to be inspected prior to each refilling and must be taken out of service for potential leaking, rupture or structural integrity. The inspection must also make sure that the sealing caps have not been broken open because that demands the container must be cleaned out. to the refiller, which will alleviate concern about whether the container is compatible with specific pesticides. “Registrants know their products best and how to get them out of containers. This written residue removal procedure is intended to be used before the containers are refilled. Additionally, the registrant has to provide the refiller with a contract that shows authorization to do refilling using the registrant’s label. “Under strict interpretation of FIFRA, every time you refill that container, you are the registrant of that product,” Fitz told the room full of ag retailers during the NAEHSS. “The bulk policy and regs are intended to facilitate that process, but to maintain that level of accountability, the registrants have to give the refillers authorization to do repackaging. Depending on the size of the portable refillable container, there are different requirements under the EPA rules, but most of those relate to Department of Transportation (DOT) regulations. Containers are classified by size of less than 119 gallons (882 pounds) and greater than or equal to 119 gallons (above 882 pounds). “The reason this was done is that when looking at packaging rules for crop protection products it just made sense to go ahead and use existing packaging requirements that were already in the marketplace that the DOT had developed,” Fitzpatrick noted. The smaller containers must be marked to indicate that they meet at least US DOT PG III/UN authorization standards. “The PG is packing group standards for DOT regs. Packing group I is the most stringent; packing group II is in the middle and packing group III is the least stringent. So, for example, if you were doing a drop test, packing group I would be a six-foot drop test, packing group II would be about a four-foot drop and packing group III a 2.6-foot drop. “What we are looking for is the UN marking in a circle, too. The top line will have the type of container and then an X, Y or Z. And a Z means it is tested and in compliance in packing group III standards, Y is packing group II standards and X is packing group I standards,” said Fitz. None of the EPA rules will change what a retailer has to do to comply with DOT regs. “The DOT labels and everything else are independent of the FIFRA labeling. If the containers require DOT placards and labels, they have to be on the container,” Fitzpatrick said. As for containers equal to or greater than 119 pounds, the DOT regulations kind of mess up the simplicity of tank marking rules. The tank should have the same markings as the smaller containers. “We say the containers have to be designed, constructed and marked to comply with the DOT regs, but DOT allows some of these larger portable containers that meet standards to not be marked,” said Fitz. Editor’s Note: This article is a simplified explanation to only the most noteworthy aspects of the new EPA rule. Follow up in filling out a full checklist will help put a retailer/refiller in compliance.